If you are planning a home renovation, chances are you have prepared yourself for the accompanying expenses. 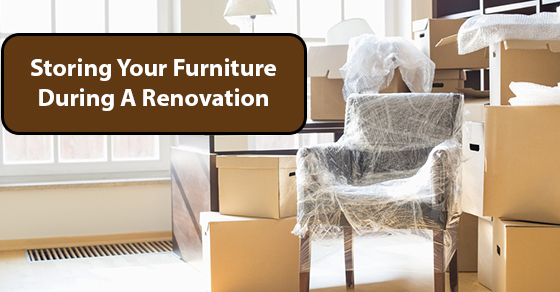 One of those that you have hopefully already considered, is what you are going to do with your furniture while you are renovating. If it is an extensive renovation and you don’t have room anywhere else in your home or business to store your furniture, one of the things that you might consider is storing your furniture in a self storage unit. Below are some things to know when placing your furniture in self storage during a renovation. It is always a good idea to inspect your storage unit before putting anything into it, but even more so if you are using it for temporary furniture storage. You want your furniture to be in top shape when you take it out, so it is a good idea to give the unit a clean, and check for leaks and pests before you place any furniture in it. It is a good idea to line the floor of your storage unit with plastic before putting any furniture in it. Plastic on the floor protects both the furniture and the floor (which you will be liable for if you damage it) and more importantly, makes it easier to slide furniture around when organizing the unit. If you are able to disassemble any of your items before putting them into furniture storage, you should. Self storage units typically charge by both the amenities that you opt for, and the space. Break down what you can and, where possible, put the pieces back into the boxes they came in, if they are still around. This will maximize your use of space, and minimize the amount of space that you need. This is probably one of the most important steps, especially if you are not going to be breaking your furniture down. If it is going in as is, wrap the furniture in padding, or storage blankets. You are also going to want to make sure that other items in your storage unit are protected. If your furniture has any sharp edges that could potentially do damage to artwork or electronics, tape or pad them off to minimize the risk of collateral damage. Furniture storage is something that you probably don’t want to worry about if you are already in the middle of a big renovation. But, if you keep the above tips in mind, you can keep your furniture temporarily stored while you overhaul a room, and know that when you take things out after the reno has been completed, everything will look as great as it did when it went in.